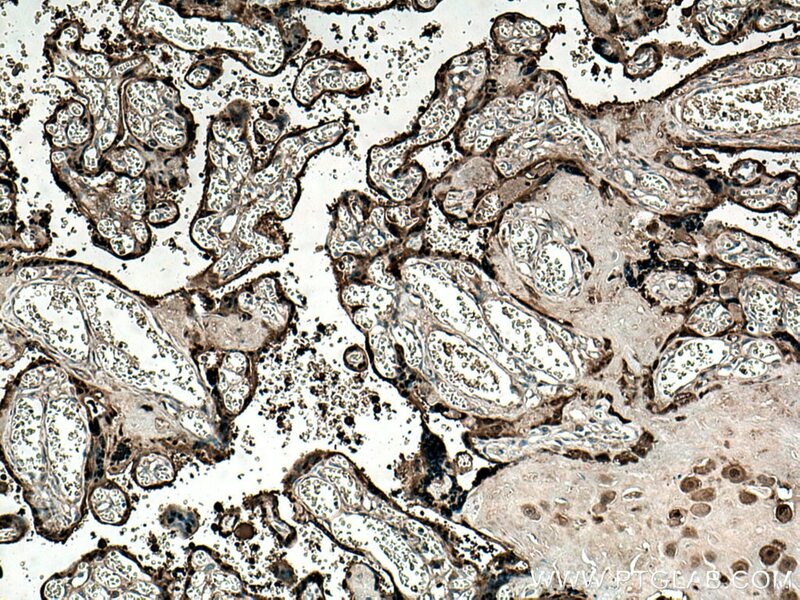 Immunohistochemical analysis of paraffin-embedded human placenta tissue slide using 15971-1-AP (CLIC3 antibody) at dilution of 1:200 (under 10x lens) heat mediated antigen retrieved with Tris-EDTA buffer(pH9). 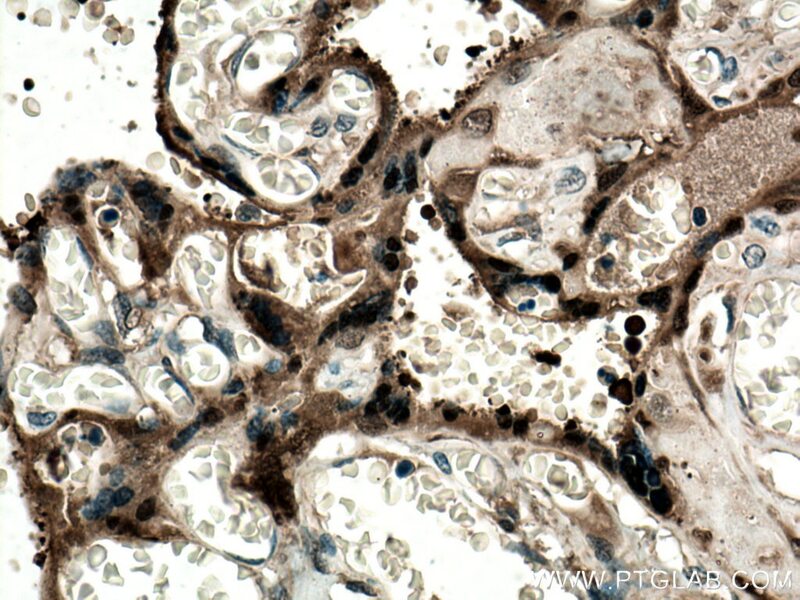 Immunohistochemical analysis of paraffin-embedded human placenta tissue slide using 15971-1-AP (CLIC3 antibody) at dilution of 1:200 (under 40x lens) heat mediated antigen retrieved with Tris-EDTA buffer(pH9). 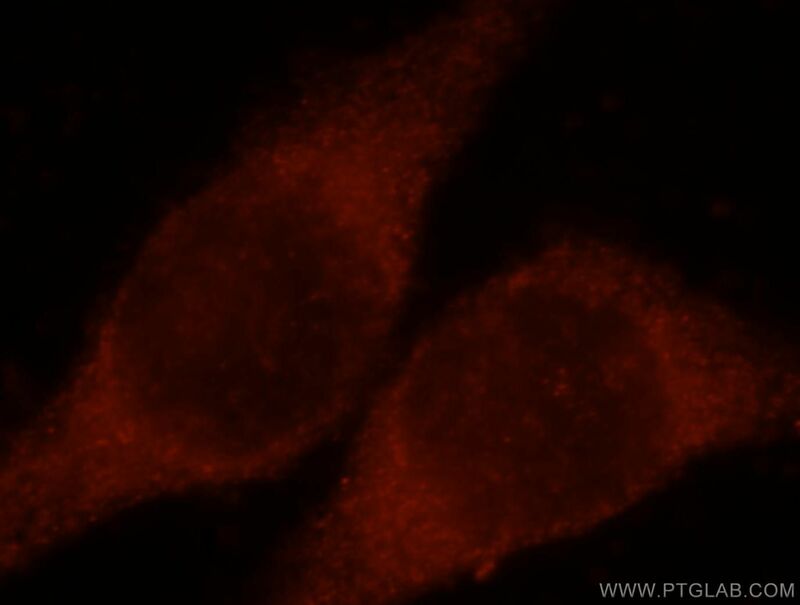 Immunofluorescent analysis of MCF-7 cells, using CLIC3 antibody 15971-1-AP at 1:25 dilution and Rhodamine-labeled goat anti-rabbit IgG (red). Chloride channels are a diverse group of proteins that regulate fundamental cellular processes including stabilization of cell membrane potential, transepithelial transport, maintenance of intracellular pH, and regulation of cell volume (PMID: 9880541). CLIC3 (chloride intracellular channel protein 3) belongs to the chloride channel CLIC family which has seven members based on sequence homology to the p64 chloride channels of bovine kidney microsomes. 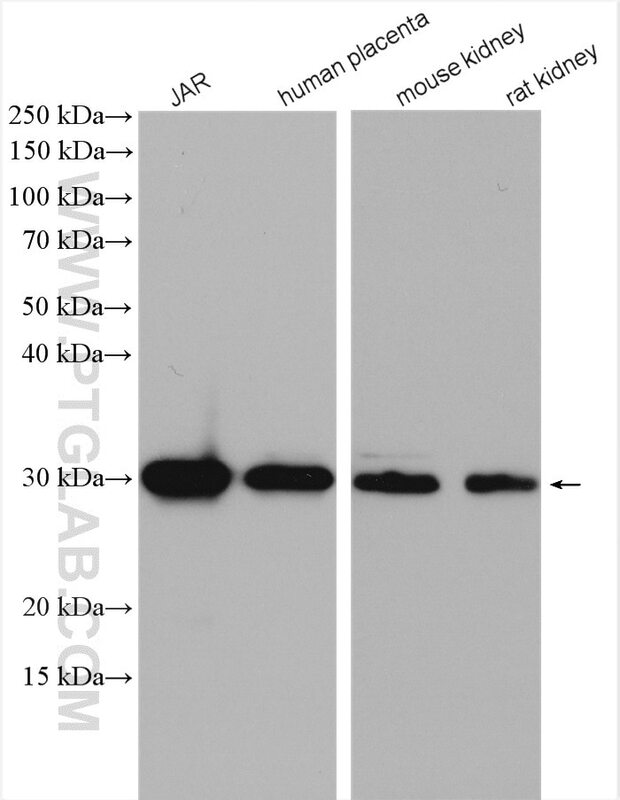 CLIC proteins lack the membrane-spanning domains characteristic of channel proteins and are largely intracellular. CLIC3 is predominantly localized in the nucleus and has a high expression level in placenta (PMID: 9880541; 17027078). It associates with the C-terminal of ERK7 and may participate in cellular growth control.